What is this? Oh, I lost. Super Hexagon is out for Android devices this week, and it's... not an easy game. Super Hexagon is a very difficult game. In fact, Super Hexagon is so difficult that I haven’t made it past the first level. Despite this, Super Hexagon is fantastic and a version of it has just been released for Android this week. Since the PC version of Devil May Cry won’t be released until next week, I’m going to crown Super Hexagon as my Game of the Week. Designed and created by Terry Cavanagh of VVVVVV fame, Super Hexagon combines incredibly simple mechanics with colorful visuals and a pulsing, memorable chiptune score. The music serves as a constant motivation, beckoning you to keep trying, even in the face of a seemingly impossible difficulty ramp. Make sure the little triangle stays away from the lines. That’s pretty much it. The game has six difficulty options, which is a rather effective way of mocking my inability to complete the easiest difficulty. These difficulty levels include Hexagon, Hexagoner, Hexagonest, Hyper Hexagon, Hyper Hexagoner, and Hyper Hexagonest, which almost certainly represent the best range of difficulties available in any game released this week (I dare you to argue otherwise). At $2.99 on Steam and $0.99 on Android for the moment, you really can’t go wrong here. 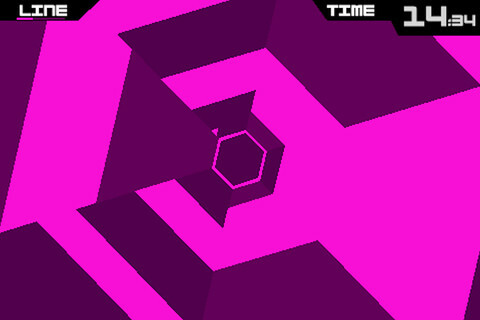 You’ll probably also want to pick up the game’s soundtrack over at Chipzel’s Bandcamp page, because in addition to playing Super Hexagon, it makes a fantastic companion to pretty much any activity.